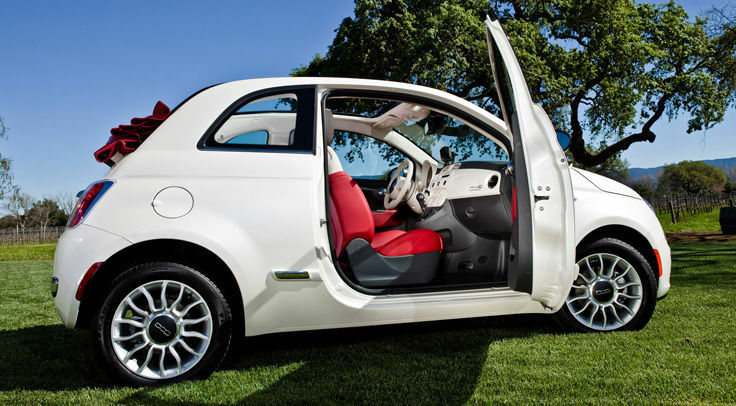 Fiat! A Fun Filled Ride! You live your life with efficient ease. Drive your car the same way. 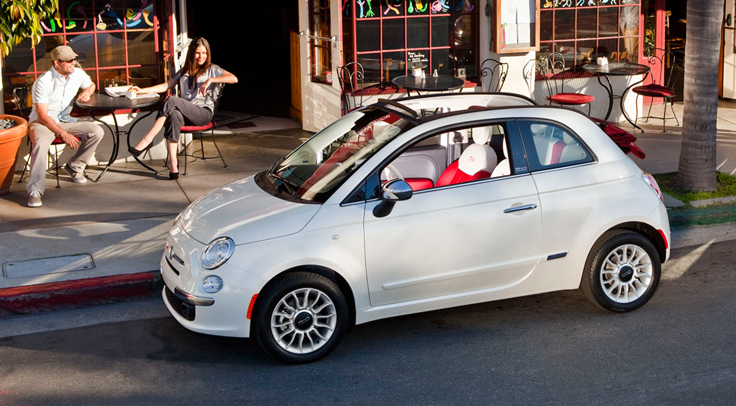 With fuel efficiency ratings of 31 city / 40 highway mpg, your FIAT 500c Lounge is anything but complicated. Protected by seven airbags, including advanced multistage driver and front-passenger airbags, a driver’s knee airbag, full-length side-curtain airbags and seat-mounted pelvic-thorax airbags, you can rest assured that you and your passengers stay secure. Your EVIC keeps you conveniently in touch with your vehicle’s information at a glance. This digital display presents speed, rpm, fuel level, engine coolant temperature and much more, as well as time, date, ambient temperature and mileage. Speak easy and listen to music hands-free while you’re on the move with BLUE&ME. Stream your favorites wirelessly with Bluetooth Streaming Audio. You’ll be amazed at what you can do with this voice-activated “must-have” convenience. 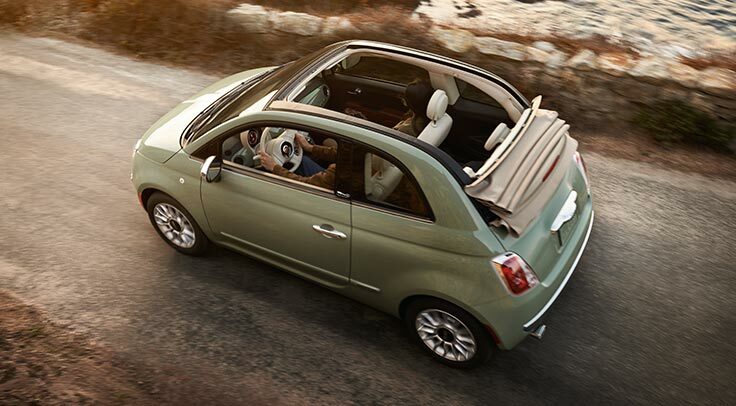 Added touches bring an extra level of luxury. 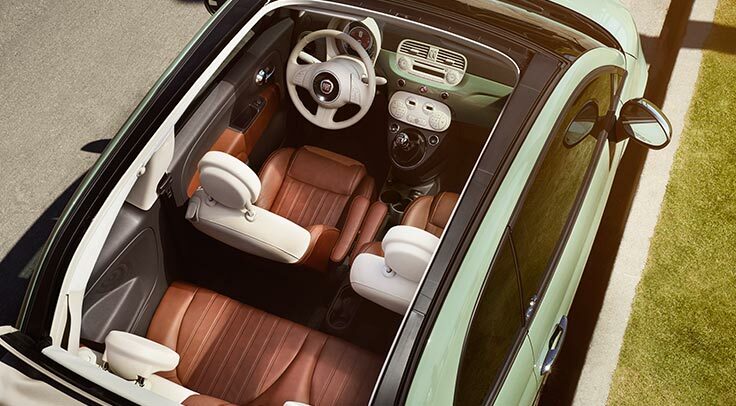 Immerse yourself in the simple beauty of the FIAT®500c Lounge with details such as leather trim on the shift knob and steering wheel. The available Luxury Leather Package includes heated leather-trimmed front seats, an auto-dimming rearview mirror and the rear park assist system. Enjoy the freedom and flexibility of your power retractable soft top with four preset positions, as well as a full cycle of stopping points, from fully opened to fully closed. This dual-layer cloth top can be retracted at speeds of up to 60 mph! How’s your truck breathing? It’s not just gulping in air, is it? Breathe in… Breathe out… Breathe in… No, you’re not in a yoga class- I’m talking about the way RAM trucks can actively manage the air around them to optimize cooling, low end torque and high end horsepower! 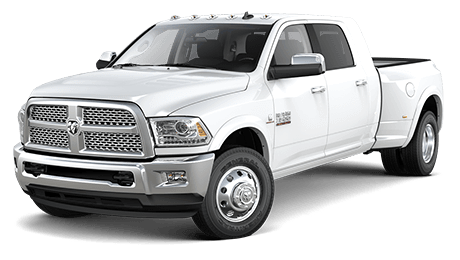 The RAM Active Air system makes sure the engine is always breathing in nice cool, clean air. Why is cool air important? Well, race cars use a cool air intake to help with horsepower and torque, but the RAM truck also uses it to help cool it’s massive powerplant. RAM Active Air normally draws air in from under the front passenger wheel well where the air is cool and the intake is sheltered from outside debris. If you’re towing or it may just be hot outside, the RAM can also draw air in from the front of the vehicle for some additional breathing. RAM’s Active Intake Manifold offers the best of both worlds when it comes to either low end torque or high end horsepower. Ever wonder why a drag racer has those long pipes coming out of the hood? Those long air intake runners help give the car lots of low end torque to get that load moving. How about a sports car? They usually have very short intake runners to help with high end horsepower. The RAM Active Intake Manifold is smart, so it can choose between a set of long or short runners. The RAM will always have the right amount of torque or horsepower, all without gulping for air! Is your truck smart enough to breathe like this? Come see the RAM experts at the Woody’s Automotive Group get started today! Now Is The Time To Buy A Viper! The Dodge Viper, among Detroit’s most celebrated muscle cars, is getting a rare $15,000 price reduction amid disappointing sales in a market that has shown a healthy appetite for pricey sports cars from domestic rivals. “The Viper, which had been carrying a base price of at least $100,000, will now start at about $85,000. While the Viper is still more expensive than the Chevrolet Corvette or Ford Mustang, the new price is more akin to its inflation-adjusted price at first launch in 1992,” Chrysler said. 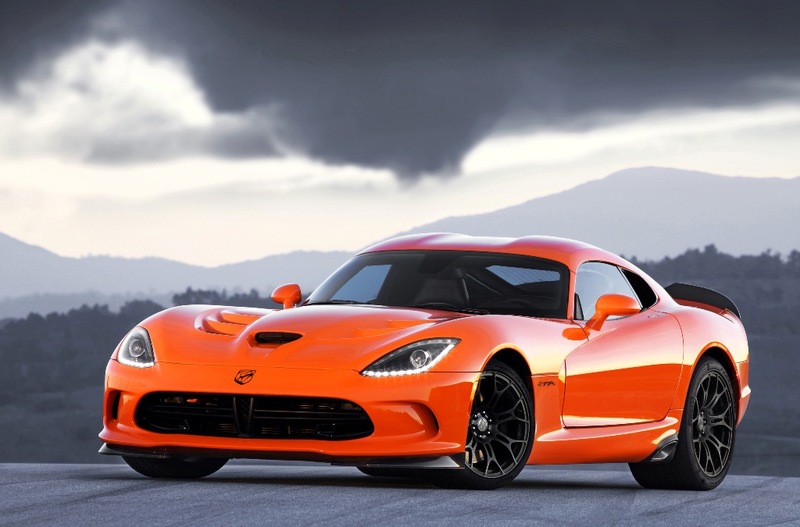 “The new Viper, the fifth generation of the auto, made its debut as a 2013 model. Anyone owning a fifth-generation model before Monday’s pricing reduction will receive a $15,000 certificate toward a new Viper purchase,” Chrysler said. SRT, short for Street and Racing Technology, has been folded back into the Dodge brand after a failed attempt to make it stand on its own. “Dealers who had previously wanted to sell the Viper needed to spend $25,000 to obtain special equipment. That initiative has been shelved, opening the door for all 2,300 Dodge dealers to sell the Viper,”the auto maker said. Want to protect your vehicle? Check out this great device offered up by Mopar! They really do think of it all! Protect your vehicle with Mopar’s Electronic Vehicle Tracking System (EVTS), a state-of-the-art GPS-enabled stolen vehicle recovery system. It features everything you need to recover your vehicle in the event of a theft, plus additional features that put other systems to shame. EVTS includes nationwide tracking without a subscription, but you’ll want to add either the Silver or Gold Plan to get a wide variety of extra benefits, including 24/7 Emergency Service Dispatch, Security Fence, Arrival/Departure Notification, Excessive Speed Notification, Trace Maps of Past Locations, and much more. Keep your vehicle safe and sound with EVTS. Do your tires cost you at the gas pump? How does your choice of tires contribute to your bill at the gas pump? There’s much to consider when selecting a tire, including rolling resistance. As engines become more efficient and car body styles become more aerodynamic, tires play a larger and larger role in the fuel efficiency of any vehicle, especially in slow driving and stop & go traffic. Much of the tire’s rolling resistance comes from the tire tread design and compound the tread is made from. A formula that includes silica or one that uses a blend of natural and synthetic rubber can reduce tire rolling resistance. Of course, the harder the tire tread is, the less it’s able to grip the road while turning and maneuvering. Interestingly enough, a worn tire is more efficient in terms of fuel efficiency. This is of course no reason to run a worn out tire- there are fuel efficient tread patterns out there. If your vehicle is due for a new set of tires, stop by the Woody’s Service Department and have a chat with Mike Hibner. Once he learns about your vehicle’s needs, he can give you a cost and completion time, no problem.